Newly-minted four-time ASP Women’s World Champion Steph Gilmore has taken out her 16th elite tour event today. SOMEWHERE, Porta Del Sol/Puerto Rico (Monday, November 1, 2010) – Newly-minted four-time ASP Women’s World Champion Stephanie Gilmore (AUS), 22, has taken out her 16th elite tour event today, defeating rookie sensation Carissa Moore (HAW), 18, in two-to-three foot (1 metre) waves in Porta Del Sol to claim the Rip Curl Women’s Search Pro Puerto Rico. Event No. 7 of 8 on the 2010 ASP Women’s World Tour, the Rip Curl Women’s Pro Search Puerto Rico saw the historic clinching of Gilmore’s fourth, consecutive ASP Women’s World Title following her Quarterfinal victory earlier today, and the win over the young rookie to take out the event served as icing on the cake. In challenging afternoon conditions, it was Gilmore who drew blood early on, locking in a near-perfect 9.80 out of a perfect 10 for a searing forehand assault on a rare clean righthander. With her Runner-Up finish, Moore moves from 5th to 3rd on the 2010 ASP Women’s World Title Race, recording one of the most impressive rookie seasons in ASP history. “Of course I wanted to win but to be in the Final with Steph (Gilmore) after she just accomplished what she did was really special,” Moore said. “I’m really thankful to be here in Puerto Rico – it’s beautiful and warm and really reminds me of home. I’m looking forward to heading back to Oahu to finish the season out. Sally Fitzgibbons (AUS), 19, was one of the form surfers of the event, consistently notching the high single-wave and heat totals each round with unmatched power and ferocity. However, the young Australian was unable to halt a late charge from a rampaging Moore in their Semifinal bout. Chelsea Hedges (AUS), 27, posted a solid Quarterfinal win over rookie Lee Ann Curren (FRA), 21, but was unable to stop eventual winner Gilmore in their Semifinal clash. The historic occasion marks the first time an athlete has achieved a perfect record in the professional surfing world, with Gilmore claiming the coveted crown in her rookie season and every year since. 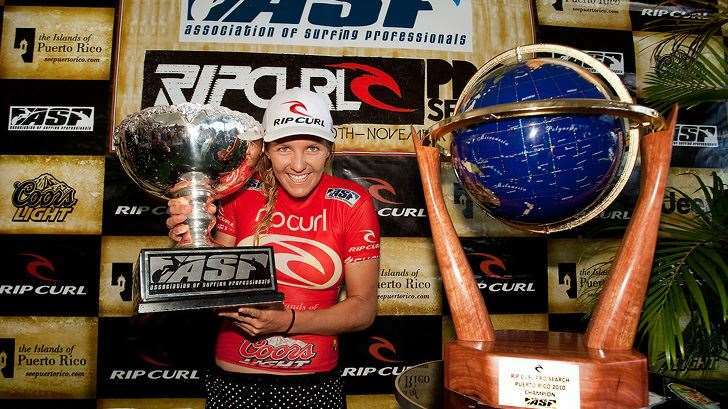 In one of her strongest performances to date, Gilmore’s comprehensive and unabated assault on the 2010 ASP Women’s World Tour marks the first time the prodigious natural-footer has clinched the crown before Hawaii.